(Sometimes called Gormania spathulifolia) This well-behaved Stonecrop species is an excellent edging or rock garden plant, particularly for hot, dry sites. 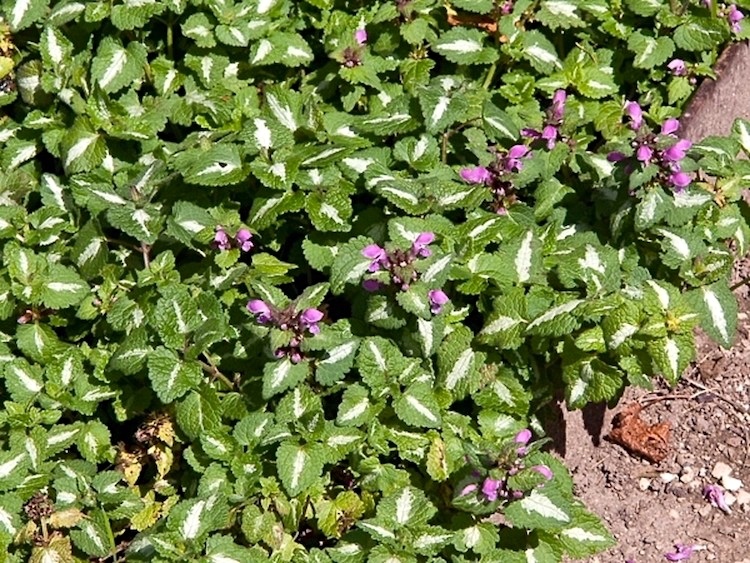 It forms a low, slow-spreading cushion or carpet of powdery, grey-green leaves. Bright yellow starry flowers appear in late summer. A hardy alpine plant that doesn’t do well in wet winters, but will do fine just outside my window, where it’s out of the rain zone. 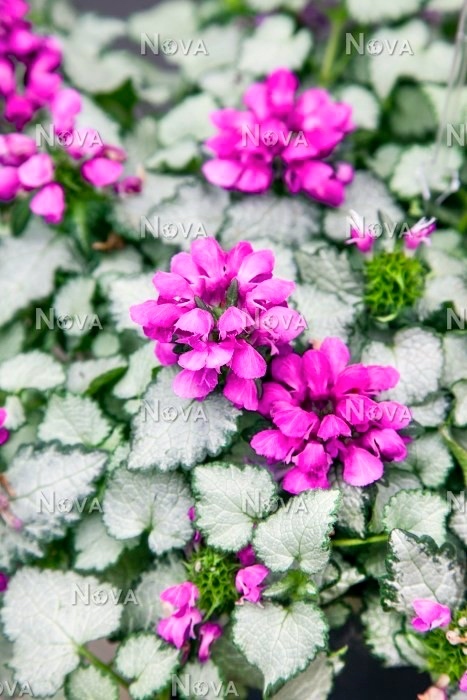 Lamium maculatum (also known as spotted dead-nettle, spotted henbit and purple dragon) is a species of flowering plant in the family Lamiaceae [the labiate family, now named after Lamium as the type genus], native throughout Europe and temperate Asia (Lebanon, Syria, Turkey, western China). 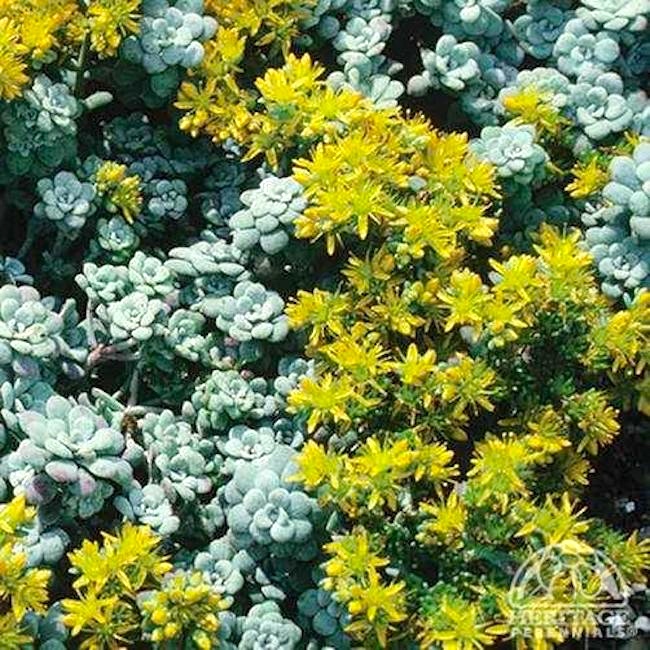 A tough and showy perennial groundcover, this forms a spreading patch of small silver leaves with a wide green edge. Clusters of large, purple flowers appear in spring then continuing off and on until fall. Fairly tolerant of dry shade, once established. Trim or mow back hard in late winter. Evergreen. Excellent choice for all containers. A pronunciation query. I haven’t been able to determine how plant people pronounce the Lami of Lami™ ‘Mega Purple’. The genus name is pronounced /’lemɪǝm/, which would predict /’lemi/ for Lami, but that sounds like “lame-y”, and who wants a lame (or lameo / lame-o) plant? The other possibilities are /’læmi/ (like “lammy”, as in the Lammys, the Lambda Literary Awards for celebrating or exploring lgbt themes, or possibly like “lamb-y” ‘lamb-like’) and /’lami/ (like “lommy”, as in the character Lommy from Game of Thrones, or possibly a portmanteau for lesbian mommy). I’m not taken with any of the alternatives. This entry was posted on May 15, 2018 at 5:26 pm and is filed under Language and plants, My life, Pronunciation. You can follow any responses to this entry through the RSS 2.0 feed. You can leave a response, or trackback from your own site.